Like most farmers and gardeners, you probably appreciate the results of good plant breeding. You also aren't alone if you find it mystifying. To help de-mystify it, allow me to tell short stories about how we bred six of our many "Bred-by-Johnny's" varieties. I think that a sufficient glossary will be mostly built into the stories. But, I should say this: the basis for plant breeding, called "classical" or "traditional" in these days of biotechnology, is simply the manipulation of mating. As a breeder, you get an idea, and you manipulate mating in an attempt to get there. Genetic engineering is something totally different — it's the mechanical transfer of a piece of DNA from a donor plant, or other kind of living thing, to another plant, with the goal of moving a trait from the donor. Mating is bypassed. If you have questions, one of us involved in plant breeding at Johnny's will try to help. Now here are the six stories. And after them, I'll briefly explain why we do this work. Tom Vigue did the work on this here, at Johnny's, in the late 1970's. We had a nice green vegetable soybean variety called 'Giant Green.' One summer Tom noticed a plant that was unique, in being a bit earlier to mature, with a more compact plant form and concentrated pod set. He saved the seeds from that one plant; that's called "Single Plant Selection" (SPS), and it's as simple as it sounds. 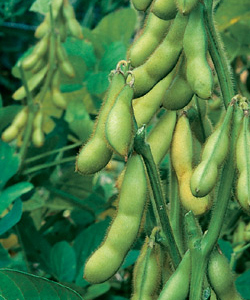 Since soybeans do not readily cross-pollinate, the SPS seeds were inbred; in other words, the plant's ovaries were self-pollinated, fertilized with the plant's own pollen. It turns out that this SPS was stable, that its progeny (offspring) were uniform (for observable characteristics). So, there you go, a new variety. The only thing left to do was build up the seed supply. Sounds easy, doesn't it? But remember this: Tom had to be in the field at the right time, he had to be attentive, and he had to recognize improved traits when he saw them. My wife, Janika Eckert, was managing the pepper breeding at Johnny's. But it had been my program, and I was staying involved. One early summer day in 2001, I was walking through the sweet pepper nursery with Janika, and I got an idea. In 1973, the first year of Johnny's, I had visited Fred Herbst, a seedsman in Brewster, NY, and Fred gave me seeds of an Italian bull's horn pepper. It was early and tasted great, but the plant sprawled. Janika had plants in the nursery. She also had plants of another bull's horn line that we had selected from a hybrid from Italy, that had a tall, strong plant form, nice fruits, and good taste, but later maturity. Janika made hand-crosses between the two, and in 2002 we grew the F1 hybrid — "F1" standing for "first filial," or first generation after the cross. It was wonderful. During 2002 she also made several more of the same hand-crosses, so we would have seeds to sample to others. We entered it in the 2003 All-America Selections (AAS) trials, the only independent North American trials for newly-bred vegetables and flowers. Enough trial judges scored it highly that AAS chose it as an AAS Winner. Happy day when we heard that. To get it on the market, we grew a lot of plants of the parents in 2003, to build up seed supply. From those seeds, we produced a commercial quantity of hybrid seeds in 2004. Janika named it 'Carmen.' Nice name. It was announced in 2005 as a 2006 AAS Winner. In 1981, I crossed 'Streaker' with 'New England Pie.' 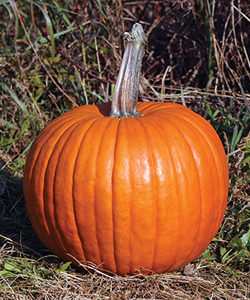 'Streaker' was a naked (hulless) seeded pumpkin bred by Dessert Seed Company, in California. 'New England Pie' was an old, heirloom variety of small pie pumpkin. The goal was a pie pumpkin with naked seeds. In 1982, I grew the F1 hybrid and began eight generations of self-pollinating (known by breeders as "selfing") and selection. Selection means keeping the favorites, which, in practice, means keeping only a small portion of the population. In other words, you have to throw out most of your work each year. It's not easy to do that, but it's essential, lest you have so many projects that it becomes unmanageable, not to mention expensive. The science of genetics, and Mendelian Genetics to be specific, shows us that all of the plants in an F2 generation (second generation after the cross) will be different from one another, a quality known as heterozygosity, but that each generation of inbreeding will increase the uniformity (homozygosity) by 50 percent. Do the math, and your plants are less than one percent variable, thus, over 99 percent uniform, in the F8 generation, after 7 generations of inbreeding. There is some vigor lost in all crops by this kind of inbreeding, but in pumpkins it isn't so bad sometimes, and the plants of JPN 659 (our pedigree number before we named it) retained good vigor. It was in 1987 or 1988, and we had an elementary school class visiting the farm in September. When the kids walked by the pumpkin breeding nursery, I saw a couple of them drawn to that JPN 659. It was a Winner in the All-America Selections trials in 1990, being the first vegetable AAS Winner in three years. We built up the seed supply and introduced Baby Bear in the Johnny's 1993 catalog. We also supplied seeds to other seed companies for their catalogs and packet racks. 2) making the single plant selections in each subsequent generation. With a crop that takes up as much space in the field as pumpkins, a breeder never has as many plants in segregating populations as s/he would like, so you're just getting the tip of the iceberg. That makes my finding that one exceptional plant that became 'Baby Bear' rather remarkable. Translate: good fortune. To balance that good fortune, there are plenty of promising parental combinations that amount to nothing. One harvest season, probably around 1985, Marvin sent me a sandwich bag of pumpkin seeds as a gift. He said that his children saved them each year for replanting. The variety was a medium-large jack-o'-lantern with a nice rib, color, and handle. So, beginning in 1986, I began self-pollinating and selecting it in the nursery each year, in an attempt to further refine the good traits. University of New Hampshire professor J. Brent Loy and I cooperated on squash and pumpkin breeding. Around 1993, I sent Brent seeds of my best selection of the Rhodes pumpkin, and he crossed it with one of his small-fruited, semi-bush pumpkin lines. Bingo. A beautiful, extra-early-maturing, medium-size Hallowe'en pumpkin. We finally had a commercial production of seeds in 1997. We named it 'Racer' and introduced it in the 1998 Johnny's catalog. 'Racer' remains one of our most popular pumpkins. Sometime after Marvin sent me the pumpkin seeds, he wrote to me that he was moving his family, along with some other families, to begin a new life farming in Kentucky, and that he wouldn't be able to continue supplying us with popcorn seeds, at least until they had gotten re-established. That was the last I heard from him. If you know anything of Marvin or his family, please let me know. 'PMR' stands for Powdery Mildew Resistance. 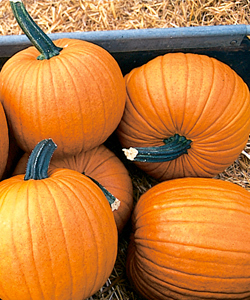 Powdery mildew is a commonly troublesome disease of pumpkins. 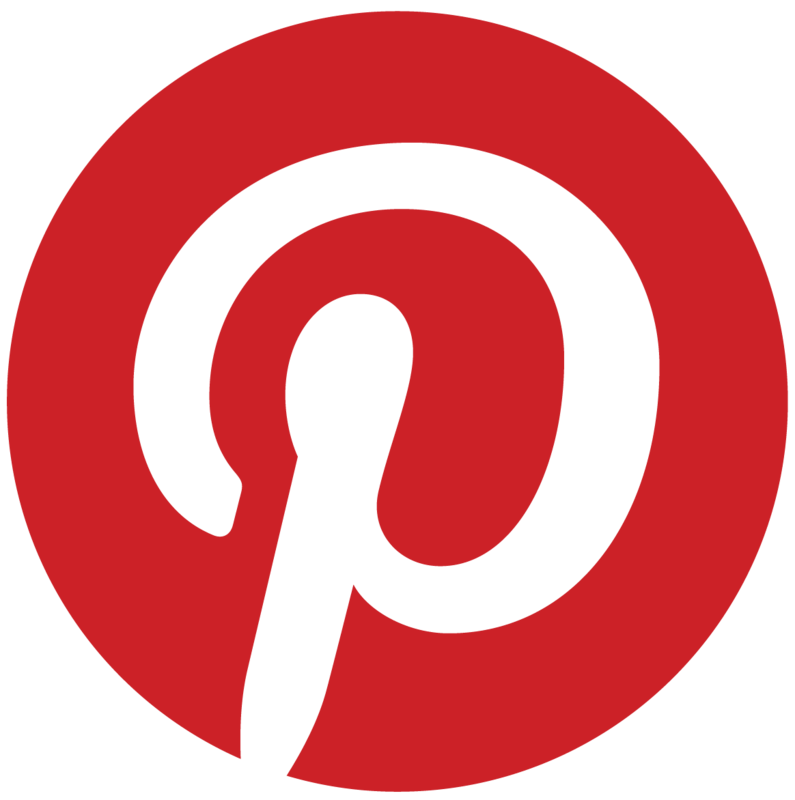 In the early 1990's, Henry Munger of Cornell University was successful in breeding PMR into yellow summer squash of the species Cucurbita pepo , from a squash variety of the species Cucurbita moschata . Like summer squash, the kind of cucurbit that Americans call "pumpkin" is also C. pepo , so summer squash mates readily with pumpkins. 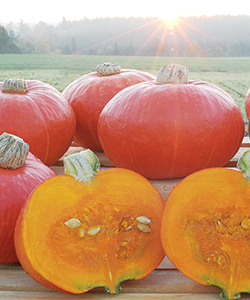 Cornell made seeds of the PMR squash available to breeders. Among those who got some seeds were Ted Superak and me. As obvious as it should have been, I didn't think of using the squash to transfer the PMR to pumpkin. 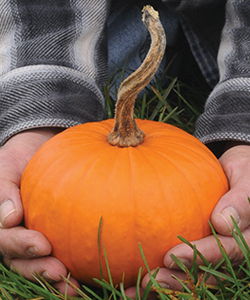 Ted did think of it, and his company, Harris Moran Seed Company, was the first to commercialize PMR pumpkins in 1999, with Ted's varieties 'Merlin' and 'Magic Lantern.' The latter became the number-one pumpkin, and Harris Moran remains the leader in pumpkin breeding. I began breeding PMR pumpkins a few years after Ted. Cornell professor Molly Kyle (now Molly Jahn, Dean of the College of Agricultural and Life Sciences at the Univeristy of Wisconsin–Madison) made crosses between the PMR squash and pumpkin, gave me some seeds, and I was on my way. The first Johnny's PMR jack-o'-lantern from our efforts was 'Charisma', which we introduced in 2005. Each season in the pumpkin nursery, we work to put PMR into our most important pumpkin parent lines, including the parents of 'Racer.' In 2006, we finally finished the breeding work on a nice PMR version of Brent Loy's 'Racer' parent. The hybrid between that and the Rhodes pumpkin retained much of the appearance and earliness of 'Racer', and we named it 'Racer Plus PMR' and introduced it in 2010. I don't think that anybody has figured out why, but orange skin in winter squash is associated with inferior eating quality. I thought that the scarlet-orange kabocha-type squashes from Taiwan and Japan were attractive but needed better flavor. This goes back to 1980, when I crossed 'Gold Nugget' with 'Red Kuri.' From that cross, I was able to select bush and short-vine lines with the scarlet fruit color of 'Red Kuri,' but I still didn't have the higher dry matter of a good-to-eat squash. Our breakthrough came in 1991: we crossed those scarlet lines with an old Japanese green kabocha called 'Home Delight,' which had high dry matter. During the 1990's, from those crosses, we successfully bred a scarlet line that retained the high dry matter. We also worked on selecting a line for intense color from named scarlet kabochas. Finally, in 1999, we crossed the two. The hybrid was a revelation for us, and, as it turned out, for the All-America Selections judges in the 2001 AAS trials as well. During 2001 we also grew quantities of each parent line. In 2002, after learning of our fortunate result in the 2001 AAS trials, we produced a large quantity of seeds of the hybrid. I wanted a name that could stick with it in the produce market. We chose 'Sunshine.' It was introduced in our 2004 catalog as a 2004 AAS Winner. Plant Breeder Rob Johnston, Jr.
Our mission at Johnny's Selected Seeds is "Helping families, friends, and communities to feed one another by providing superior seeds, tools, information, and service." 2) the avid home gardener. If you think about it, they typically grow a wide variety of crops and aren't apt to have ideal weather or soil, or perfected skills to grow all of them, but they still want to end up with good yields of high-quality produce, particularly good-tasting produce. So, it's our objective to provide the seeds that will best help them do that. The crux is this: the varieties have to be both easy to grow in a range of climates and soils, and good tasting. The two keys to our providing those varieties are our cooperators and our own plant breeding program. We have dozens of relationships with individuals we call "cooperators": breeders and seed producers of innovative vegetables, herbs, flowers, berries, and farm seeds and tools. 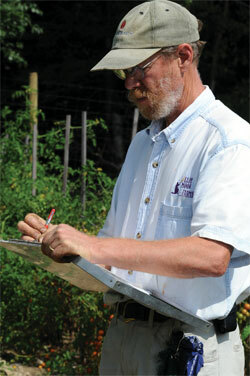 Each year we grow and evaluate "trials" of all of the important crops. A "trial" is where we grow side-by-side and compare new varieties from these cooperators, current Johnny's varieties, new experimentals from our breeding programs, and our competitors' best varieties. A trial is our proving ground, the main tactic in our decision-making about changes in the product line. Vegetables are our largest product category. 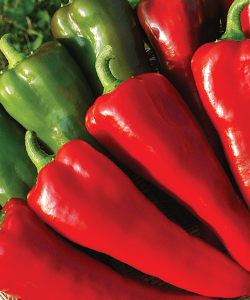 Most vegetable breeding is geared towards the big acreages in the primary commercial production areas. Using North America to illustrate, lettuce breeders typically focus on California and Arizona climates with bright, dry conditions; tomatoes for fresh consumption are mostly bred for the big acreages in dependably sunny and warm Mexico and Florida. Sometimes one of these varieties will satisfy our easy-to-grow and good-tasting requirements and will make a good candidate for our product line. Not always, though. So we try to focus our plant breeding efforts at Johnny's on the niches left unfilled by other breeders with whom we cooperate. For example, hot weather tolerance isn't an objective of a typical lettuce breeder, leaving an important need of many of our customers unfilled. So, it's one of the most important goals in our lettuce breeding at Johnny's. The same goes for resistance in tomatoes to fungal foliar diseases: early blight, late blight, and Septoria leaf spot. Thank you for reading. And thank you for your business. We are interested in hearing your questions and your suggestions.